When Papiss Cisse was handed the ball just before half-time, I think it was fair to say that there were a few worried faces in the crowd despite it being Newcastle handed a golden chance to go two up. 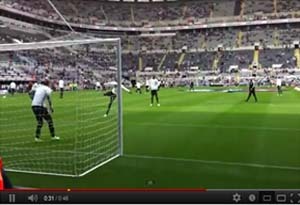 Sure enough, Papiss Cisse strode up and put his spot-kick in row Z of the Gallowgate end. Watch this exclusive video footage though and you’ll see an obvious clue as to why Ben Arfa should have snatched the ball straight back from Cisse. Brought to you courtesy of The Mag’s YouTube Channel.